***Recent restaurant reviews: Restaurant Mercuri, Bar Mercuri, Le Serpent, La Chronique, Jun I, L’Européa, Sushi Yasu, Kyo, Peter Luger, Kam Fung, Firegrill, Patrice Patissier, Raku, Au cinquième péché, Au Pied de Cochon, Callao , Shinji, Mochica. It’s my first visit at Mochica. The place is simply, but prettily decorated. They have a terrace too, which is where I sat. The location is on Saint Denis, in the Le Plateau area. The cooking here is Peruvian. 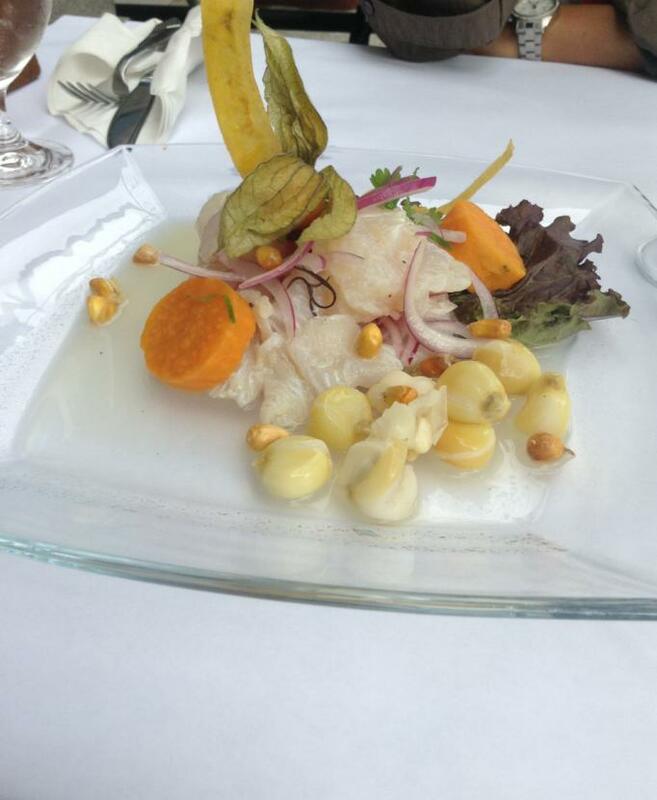 Started with a Pegasus fish ceviche ($12) The fish, on this instance, was of ok quality. Its leche de tigre (the marinade) was nice, having expressive fresh lime fragrance and a nice piquant to it, done as it should (it got close, indeed, to what the Grandmas of my Peruvian friends at whom I have enjoyed ceviche, in the recent years, have offered to me). Sweet potato was not as impressive as those I am accustomed to, certainly less enjoyable than the one I had last time I ate at Las Tres Conchitas, another Peruvian restaurant of Montreal. Fried corn was Ok, but I had better corn of this sort at other Peruvian restaurants. All in all a 5/10 ceviche, for me, as I found the fish not as exciting as I am accustomed to at some various Peruvian eateries I ate at in Montreal, its marine robustness less evident. Arroz de Mariscos ($21) was akin to a paella of seafood, the rice properly cooked in fish stock, turmeric and saffron were present but did not lift the dish with the usual aromatic dimension that I came to expect from most examples of this dish that I enjoyed at plenty of Peruvian eateries here and abroad. They were too discrete in terms of flavor. Not bad, not great. 5/10 for my taste. 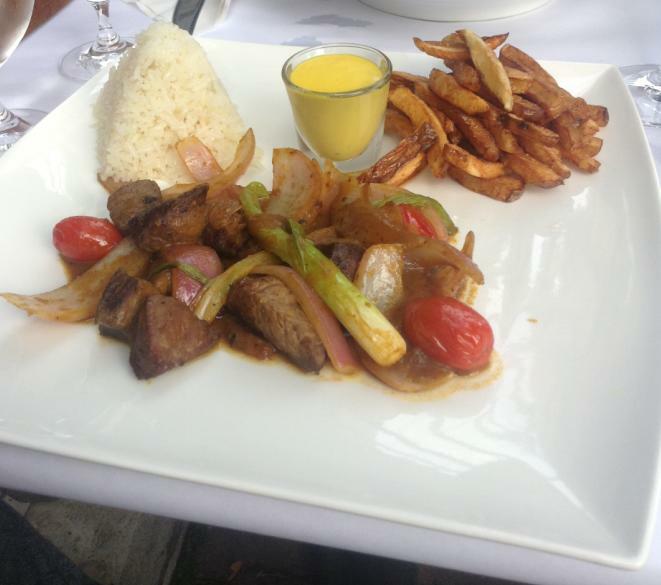 Lomo saltado ($25) is a Peruvian beef stir fry dish. This dish is one of my favourite Peruvian dishes as it is one of those dishes that lures you into believing that it is easy to cook, and in a way it is (stir fry beef), but in reality it relies heavily on the quality of the meat as well as the touch of the cook (for eg, in this instance, how far he can push the seasoning to make it taste genuinely Peruvian). The meat (angus beef) was unfortunately dry, not tender, and its seasoning not as distinctively Peruvian as I am accustomed to with the fine lomo saltados I had in Montreal within the past recent years. There was also red and green onions, garlic rice (ok), huancaina salsa (mixed with parmesan and goat cheese in this instance — this, for my taste, was unappetizing / the mix of parmesan and goat cheese stood as way too pungent to match the french fries that came with this dish. The salsa deserves its own paragraph – see below***) 4/10 for my taste. ***The huancaina salsa – The one I was having, on this specific evening, boasted some aspects that do defeat the point of the huancaina salsa. The point of this kind of salsa is to balance mild lactic flavors (usually queso fresco featuring mild goat cheese, or a midly flavored blend of goat/cow cheese + fresh milk) with peruvian peppers.Plenty of Peruvians I know do sometimes mix the salsa with some baking soda biscuit for texture, but you’ll never see them overwhelming the salsa the way it was on this evening. Such balance is the one by which the huancaina salsa lives or dies. So you have no other choice but to stick to that simple principle: fresh mild lactic flavors against Peruvian peppers. What was done on this evening was unreal: the mild lactic flavors were not only overwhelmed by the pungent goat cheese…but as if that pungency was not enough, the cook added Parmesan cheese to it.. … inevitably leading to flavors that make no sense for a palate. Overall food score: 4/10, for me, by the finest Peruvian cooking that I am accustomed to in Montreal. As ever, I am not expecting an exact replica of what is done in Peru, and to be accurate, that will not make sense. 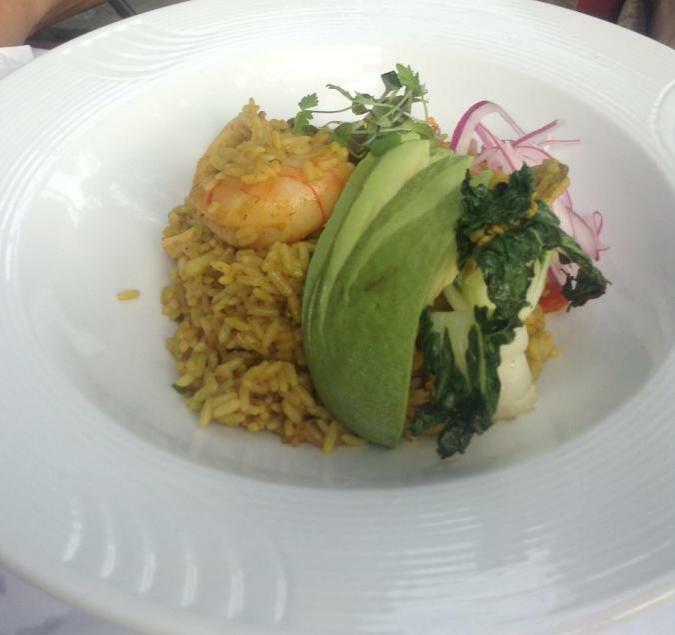 But we have an important community of Peruvians in Montreal, therefore getting close to a sense of Peruvian mom-and-pops genuine flavors is certainly something we, Montrealers, are not that unfamiliar with. My meal, on this evening, did not leave such impression. I certainly had better Peruvian food in Montreal. Conclusion: It’s a restaurant that I wanted to like as the decor pleases me a lot and the service was nice, Peruvian food is a cuisine that I like a lot (there’s just the Jalea that’s not my cup of tea) especially because they deal extensively with my lifetime sacred ingredient which is seafood, their sauces are great, the way they season their food right up my alley, but my first rendez vous with Mochica was unfortunately unsuccessful. It will take me some time to understand how a huacaina salsa can go wrong: simply follow the basic recipe and you will understand how simple it is to make it right (blend peruvian peppers/a bit of fresh milk/a bit of oil/queso fresco, garlic/onion/a bit of salt…and tell me if you really need to overcomplicate that? It’s so delicious in its simplicity. Perhaps just an off day, so I’ll give it another chance. Hopefully my next visit will fare better, but for now, on the back of this sole meal, I personally found Las Tres Conchitas and Solymar (equally Peruvian) to have the edge. What I think days later: I just hope it was just an off day as food this simple has no other choice but to dazzle with exciting flavors which is the point of most latin american cuisines.If a shrimp is to boast the taste of any ordinary shrimp, if rice is not going to be any different from any average rice dish, then one may as well enjoy those things at home.